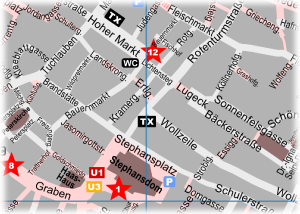 The different Vienna taxi stands in the center are marked with a "TX" symbol in the city-walks map. It's very easy to recognize all officials Vienna taxis because the car license plate always ends with "TX". The cheapest and quickest way is to go to one of the stands. If there is no car available then you should use the phone at the stand to call a car because for that you have to pay the lowest extra charge on the taxi fare. On Sundays, public holidays and in the night between 23:00 and 6:00 o'clock you have to pay approx. 15% more for the fare. One ride in the center of Vienna normally doesn't cost more than 15 Euro. For a ride to the outer districts you have to calculate with up to approx. 25 Euro for the fare. The costs for a Vienna taxi of course varies due to the actual traffic situation.